A way to get to know me. You step inside, a first-time visitor. You accept some hospitality, something to sip on, something to eat. Your host disappears into the kitchen, from which clinking or boiling sounds and questions emanate. You look around, taking the place in. You see the bookshelf. The rest of the room dims, turns into background. Before you know what happened you’re standing in front of it, eyes and perhaps a finger gently tracing the cracked and wrinkled spines, the authors’ names and titles printed on them. Some you know, some you don’t. Maybe some are in your to-read pile (you never can keep up with it). Those are most exciting of all, because maybe your new friend has read them and can tell you about them. You pick a volume at random, one you don’t know, and open to a random page. The smell of the paper wafts gently into your nostrils, the traces left by the eyes and fingers of those who’ve read these words before are almost tactile. The words slide through your pupils and fall like rain into your self; they sink into the loam of your life-world, send shoots and rhizomes out into the soil around them, grow into the latticework of intertwined roots that have been weaving themselves together since your parents first sat you down on their knee and taught you the magic trick that turns little lines and curves on paper into imagination. Despite the solitude in which it’s performed, reading is one of the most intimate activities there is. To read something is to bring it inside you, to let it touch your heart, your mind, and whatever you choose to call the thing that animates and unites them. To have that experience in common with someone else opens a channel between you, gives you something to talk about, provides an opportunity to form a bond. We are book people, that bond says. We understand what it means to be lost in other worlds, to follow and be moved by our own imaginations and others’. There’s a great deal of noise being made about the future of publishing and the revolution therein that e-readers and our dreaded, beloved internetz are in the middle of carrying out. To hear some tell it, the printed book will be one of the first against the wall. The lamentations are premature, I believe, for many reasons, not least of which is the comfort we book people take in the presence of our libraries, and how they help us establish and display who we are; the way they quietly broadcast our history, our taste, and sometimes our aspirations. There’ll be changes to the way books are printed, and even the reasons why. There will probably be fewer of them, which may or may not be a bad thing. But no one’s going to come over to your place and scroll through your kindle to find out who you are. Actually people now you more easily by your kindle than by the books you browse to in your local library. I take my kindle everywhere and people most often than not browse through my e-library. A lot more often than they do at my tiny library back home, or at the public libraries I frequent. It’s nice to hear such a passionate description of books and their disappearance is not anyway near. I could not agree more with what you say here and books are definitely here to stay I think. I think only because bookish people need books more than to read them. I plan to decorate my whole house with books. 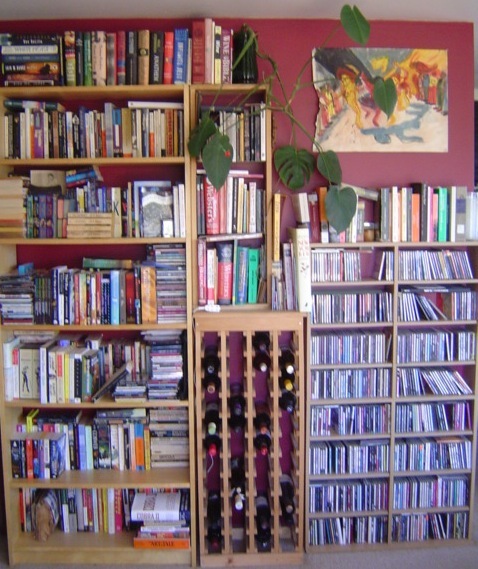 Every room must have books in it. I love the way you describe the setting. No one ever browses my nook library unless they want me to try out lending them books. Plus, my friends already know I’m bookish so they come to borrow from my shelf.